"you are a teacher who truly loves teaching, who makes learning an adventure, and inspires kids to do their best. Thank you for always being ready with a kind word or attentive ear. Thank you for creating an environment where the children are truly supported and special. It is the tiny moments each day...when you let the kids keep a lego they built together for next time, or when they have yet another treasure they just have to bring for show and tell that makes a difference. As a family, we are truly touched that you have been part of our children's lives and education. Thank you! M & C M.
"Our grandson can hardly wait for his school days to roll around! I credit you and your staff for providing such a nurturing environment; a calm and positive experience for first-time schoolers. He is really blooming! Thanks for making those first days of school a success." J.H. "Our son has learned alot, made some great friends and really gotten excited about learning. All the teachers here are great and help the kids think through things on their own. The kids have fun and are able to be creative in a safe and nurturing environment." 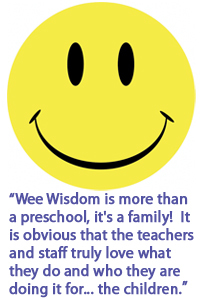 J.B.
"We have heard that Kindergarten teachers in the BSD can often spot Wee Wisdom children because they start Kindergarten ready to learn and know how to interact in a classroom. My children have been gently guided in learning how to be part of a classroom community, how to contribute in a positive way, and have the confidence to be independent learners. The teachers have an amazing ability to understand and respect each child's strenghts and challenges." Jennifer H.